Just as a good looking guy or gal turns heads, so too do the eye-catching book displays at the Fairfield Public Library and Fairfield Woods Branch Library this week. Wrapped attractively in colorful plastic bags or paper and decorated with hearts, the books provide enticing hints about what is hidden underneath as they beckon patrons to take a chance, check them out sight unseen and remove the coverings to reveal their titles. 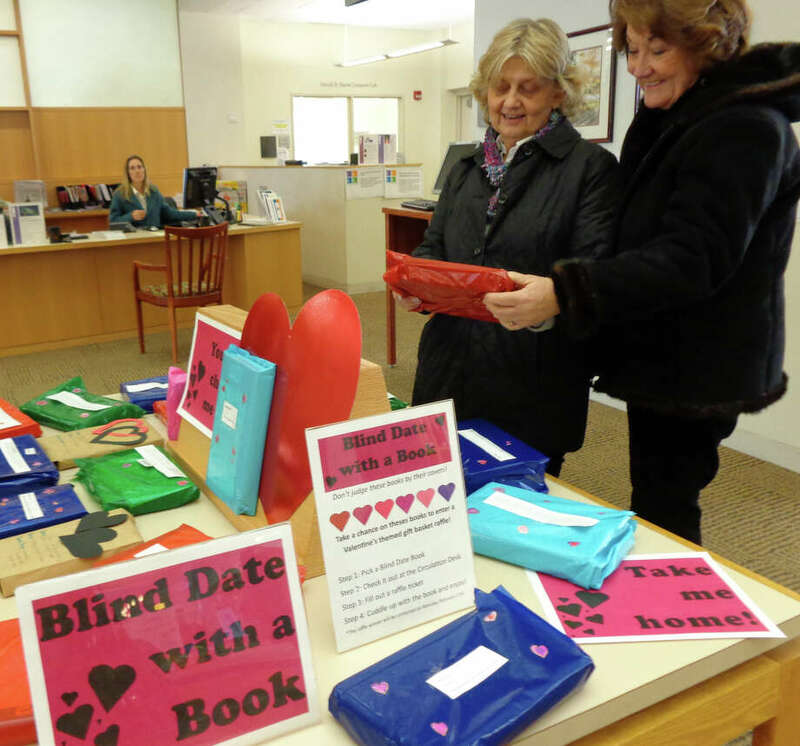 This is the first year that the library has offered "Blind Date with a Book," and apparently book lovers fell head-over-heels for the concept. By mid-afternoon Wednesday, only five books remained on the table for adults at the branch library from the 30 that were wrapped earlier in the week, according to reference librarian Jessica Stevens. At the main library, Nicole Scherer, head of teen services, continually replenished the stock for adult and teen readers. Patrons were asked to pick a blind date book, check it out at the circulation desk and "cuddle up with the book and enjoy." Those adventurous enough to take a book on a blind date are entered into a raffle for the chance to win a Valentine's Day-themed gift basket. "It's not an original idea, but it's the first time we're doing it here in Fairfield. It's an idea a lot of us (librarians) saw on Pinterest," Scherer said. "A lot of people come in looking for recommendations and new things to try, especially during a winter like this when we've all been kind of housebound." Ginny Jacobs, of Fairfield, visiting the main library Wednesday, thought it was a wonderful idea because it might encourage people to "read different literature than you would normally read. It opens up your mind to different genres." "It's a cute idea, and it's nice with the pink and white (displays). With this winter we're having every little perk helps," said Arlene Johnson, of Fairfield, at the branch library. Lots of speed "dating" went on Wednesday as some patrons hopped from one wrapped book to the next reading the flirtatious comments that aimed to seduce readers. Not everyone was drawn in. Johnson said she has "other books that are first." "I have too many books for me to go on a blind date with another book," said Rosemary Crossland, of Fairfield. Scherer said the Blind Date with a Book was due to conclude Friday -- Valentine's Day -- but it may be extended into next week because Thursday's snow storm closed the library.